Crusaders Ronan Hale celebrates scoring his first goal for the club, at Institute. CRUSADERS bounced back from their defeat to Linfield, with a comfortable win at Institute. Their slick counter attacking football ensured they always looked a threat and in truth could have won by a bigger margin. Goals from Paul Heatley, Rory Patterson and Ronan Hale in the first half, meant the game was over as a contest at the break. For Paddy McLaughlin, although his side scored in the second half, 'Stute had one really good clear cut chance when the game was still in the balance, but Ronan Wilson's drive was bravely blocked by Kyle Owens, then Crues showed them how to do it and scored a double just before the break. Both manager's rung the changes as they looked to bounce back from defeats last weekend. McLaughlin gave youngster Conan Doherty his debut in goals replacing Marty Gallagher, while Ryan Morrow, Colm McLaughlin, Michael McCrudden and Thomas McBride also started. As for the Belfast men with trio Howard Beverland, Colin Coates and Michael Ruddy all suspended and David Cushley and Jordan Owens dropped to the bench, they gave starts to Sean Ward, Kyle Owens, Patterson and Ronan Hale. The visitors started on the front foot and took the lead on 13 minutes following a slick counter attack which saw Patterson nod the ball into Ronan Hale's path, the striker cross field pass found left-winger Heatley, who steadied himself before drilling home his 20th goal of the season, with a neat finish. 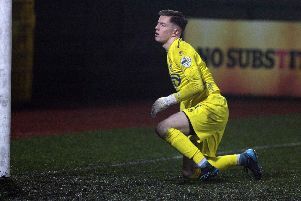 In the lead up to the goal, Stute centre-back Caoimhin Bonner suffered an ankle injury and had to be replaced by Wilson. The home side started to get more and more into the game and went close on 30 minutes but Joe McCready's shot was saved by Crues keeper Gerard Doherty. Soon after the visitors should had doubled their advantage as Heatley's left wing cross found Ross Clarke, but the midfielder headed wide from six yards. On 39 minutes the home side cut through the Crues defence thanks to passes from Ronan Doherty, McCrudden and Aaron Harkin, but substitute Wilson saw his well hit drive, superbly blocked by a diving Kyle Owens. Three minutes later and Crues added a second as Patterson blasted home from close range, after the unfortunate Morrow could only divert the ball straight into the striker's path. The game was over as a contest on 44 minutes as Ronan Hale, like Patterson, marked his return to the Brandywell with a goal, heading home from close range, after young keeper Doherty could only parry Heatley's initial shot. The Crues were forced into a half-time change with goalkeeper Gerard Doherty replaced by Sean O'Neill, as the Brandywell man picked up a calf problem. Crues should have added a third on 64 minutes a Ronan Hale played in Heatley down the left, but his shot on the angle failed to test Doherty and hit the side netting. Institute did pull a goal back on 74 minutes as much talked about striker McCrudden, skipped through a few challenges inside the Crusaders penalty box, before firing home with his weaker left foot. Soon after Hale should have added a fourth when he won possession from Harkin, on the edge of the box, but his low strike was well saved by Doherty. Minutes later Hale went close again as his super drive from the left hand side of the box, drew a good save from Doherty. Institute: C Doherty, Jarvis, Bonner (Wilson 17), D Curry; R Morrow (Smith 83), McBride (J Morrow 58), R Doherty, Harkin, McLaughlin; McCrudden, McCready. Crusaders: Doherty (O'Neill HT), Burns, Ward, K Owens, Forsythe; Lowry, Rory Hale, Clarke (McGinley 81); Ronan Hale, Patterson (J Owens 81), Heatley.